In celebrating Star Trek's 50th anniversary, we featured Star Trek Panic! from Fireside Games and USAopoly at our September Big Game Night. Star Trek Panic! is based off of Fireside's popular Castle Panic! game. The goal in STP! is to complete 5 missions while being bombarded by all sorts of enemies. Each player takes on the role of a crew member and has a hand of cards that allows them to take actions to accomplish the goals and defend or repair the ship. While we didn't fare so well, all had a good time. Also hitting the table was Grifters from Indie Boards and Cards. This is a unique hand management, set collection game in which each player represents a rival gang that are competing to pull off the biggest jobs and gain the most money. The twist on this game is that when you play a card or set of cards to your player board you get their action but they then advance across the board over a series of three 'nights' or turns before you can reclaim them to your hand. This offers another level of strategy for managing your hand. Each card represents a 'Specialist' that has a unique ability and they also come in three different colors or suits that you will match up to claim the 'job' cards. The more job cards you collect of the same type, the more they're worth. Easy to learn and fun to play. Other games that saw some action were New York 1901, a gateway-level area control game, Betrayal at House On the Hill and Mystic Vale. Mystic Vale is AEG’s new game representing the debut of their Card Crafting System. 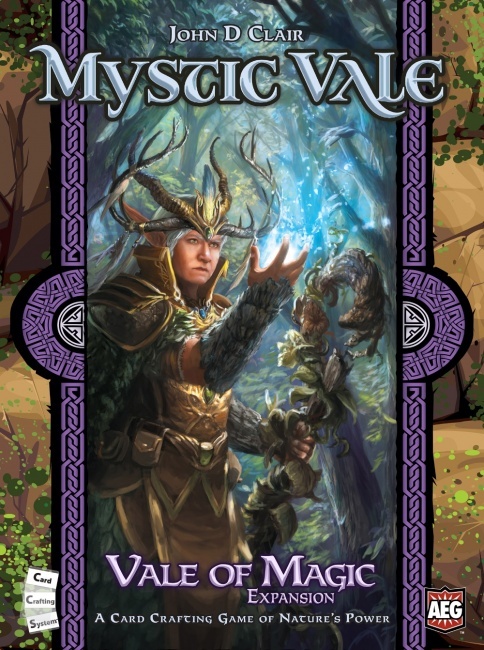 At it’s core, Mystic Vale is a deck building game. For those unfamiliar with this mechanic, players start with a basic hand of cards that they use to purchase (or, in some cases, defeat) better cards in a central pool. These will, in turn, give them points and/or provide more resources to acquire even more advanced cards. What makes the new Card Crafting System unique is the ability for players to customize the cards as they get them. This is done by having clear cards that are segmented into 3 distinct sections. As the cards are acquired, they are placed into a clear card sleeve that has that particular one-third section unused. This allows cards to be built to have more resources in the types and quantities the player feels necessary for their particular strategy. Apart from these resources, some cards have text that describe special abilities or actions that a player may use. Aside from the deck-building / Card Crafting, there is also a push-your-luck mechanic that manifests in the way a player draws the cards. A certain type of ‘bad’ resource is corruption. A player initially draws cards, face-up, until 3 of the corruption symbols are showing. Then, they have the option to continue to draw (perhaps trying to get that extra resource needed to buy that sweet card they have their eye on). If another corruption symbols shows up, the player goes bust and basically loses their turn. As a consolation, they may be able to add one extra resource their next turn. The game is over once a certain amount of point tokens have been accumulated, dictated by the number of players (2-4). At this point, final scoring is done and points are added from both tokens and cards, and, of course, high score wins. Mystic Vale is a unique spin on the traditional deck-builder. Its mechanics are familiar enough, to those that have experienced this type of game, to jump right in while remaining simple enough for new players to learn easily. It is a beautiful looking game. The art and components are top-notch and the box has a nice insert to hold it all. There’s lots of opportunity for expansion as they can always add new cards and some new mechanics to keep it new and fresh. As of this writing, an expansion has already been announced for release this year! As clear cards are inserted into the sleeves to ‘Craft’ better cards, the thickness is noticeably increased. Some players have complained that this clues them in to which cards are coming up in their deck and therefore allows for some unintentional cheating. We have not found this to be a problem so far. Once players get deeper in the game and have placed multiple inserts its not really practical to be able to discern between the cards and we really just don’t pay that much attention to our draw decks until we’re actually flipping those cards over. Another concern is how those sleeves will hold up over time. This is probably a valid point, but AEG does include many spare sleeves in the box and if/when sleeves do need to be replaced, the cost of a pack of sleeves is negligible and one pack will probably go a long way. Also, the clear plastic cards can be prone to scuffing. We don’t believe this will really affect gameplay all that much for quite a long time. Overall, we’ve found this to be a very enjoyable game. Anyone who likes deck-building types of games should definitely check it out. Finally, it’s a fun note that Mystic Vale was initially presented by the designer as a sample game to demonstrate the Card Crafting System. However, AEG felt this was good enough to publish as a stand-alone introduction for players. Another, more robust game (Edge of Darkness), will be coming in the near-future from AEG that looks to be more of a campaign-driven experience with more options and conflict.